Delineators and bollards play an important part in traffic control. They can be used to ensure that traffic stays in the correct lane, or to prevent unauthorized vehicle access to out of bounds areas. When traffic needs to pass through work zones or potentially confusing road layouts delineators can be used to mark out lanes and ensure safe passage. They are an essential driving aid that can vastly improve safety by providing clear visible boundaries when positioned and installed correctly. All our delineators are highly visible and include two retro-reflective bands. These bands help motorists spot the delineators in low light and poor atmospheric conditions. All our traffic delineators and bollards are made of a flexible plastic that is less likely to damage vehicles than metal or concrete. This bollards removable and does not have the same flex as a delineator. Although it will move a small amount, it is not designed to fold over completely. However, it is more vehicle friendly than concrete or steel bollard posts. For this reason, it is great as a semi-permanent bollard, for marking out and restricting access to off-limits areas. The Bumper Bollard is available in orange, yellow, green and blue colors, this can be used to color code parking areas or zones. Pedestrian Areas - It is sometimes necessary to prevent vehicles from unknowingly driving into pedestrian areas. Parking lots – Prevent access to off-limits areas, or segregate the parking into different sections. When installing this bollard, you should ensure that they are positioned close enough together that vehicles cannot drive between them. If using them as a visual aid at the front of parking lot spaces, then one per space in the center is ideal. This delineator is ideal for marking out lanes and channelizing, it can be run over and will spring back into shape without hesitation. Delineators play an important part in safely guiding traffic through road construction or on ramps and off ramps. The flexi-post is available in orange only. Drive Thru – Provide clear visual lanes for the drive-thru. This will help prevent distracted drivers from accidentally leaving their lane and colliding with other vehicles. Channelizing - The flexi-cylinder can be used to ensure traffic lanes are marked out clearly. Marking lanes out clearly is essential to ensure that easy and safe passage for any vehicles passing through the area. Construction sites - Construction on the road often means a change of layout to a familiar stretch of road. Our markers can help guide drivers through what could otherwise be a confusing situation. When setting out delineators the layout required depends on where they are being used. The distance between each post and position in relation to the lane needs careful consideration. If marking out a tight curve in a lane, then the posts will need to be closer together than when marking out a gradual bend. They can be recycled– Both our delineators can be completely recycled. Allowing you to dispose of them properly and in an environmentally friendly way when they are no longer needed. Both are twist lock – They fit into the bolt down base units with a simple twisting motion. This makes them secure yet easy to change should they become damaged or need to be removed for access. Have different mounting options – We offer a standard base that bolts down onto the asphalt, offering permanent mounting points for the delineators. We also offer the ‘road rock’ a portable base that can be moved quickly and set out with ease. They both feature reflective banding – This makes them easy to spot for drivers, cyclists, and pedestrians. Giving adequate warning of their presence. Post Base – This is what fixes or rests on the floor, it offers stability and holds the post in place. Depending on your requirements you may need a bolt down base, or a mobile ‘road rock’ base. If using the permanent base, then it can be left in situ when the post is removed. It is safe to be run over by vehicles and will not cause any damage to the vehicle or the base. Post Top – This is the vertical section of the delineator; it is able to take the impact of a vehicle hitting it. 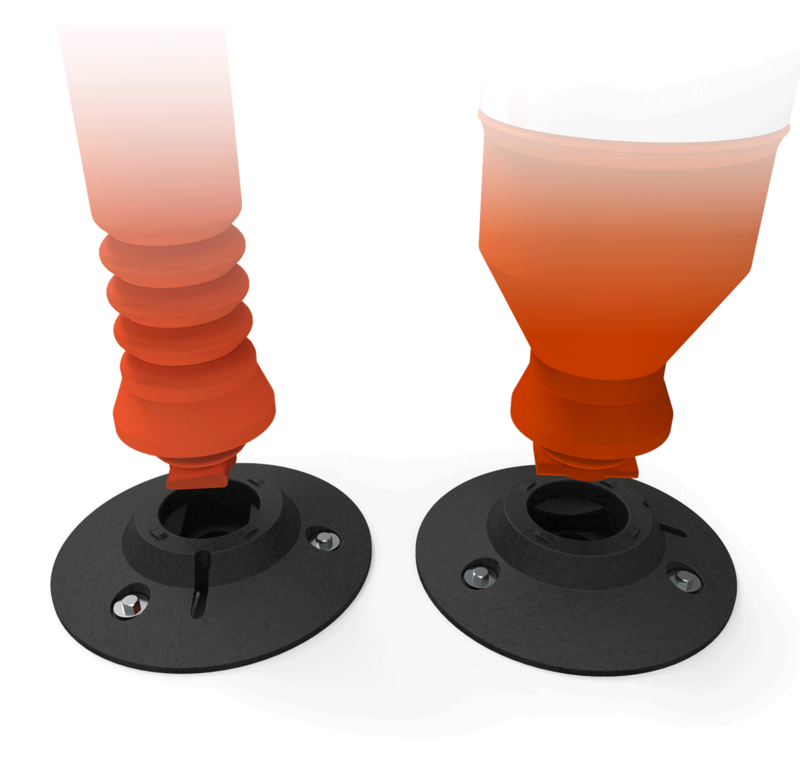 The post is made from blow molded plastic allowing them to shrug off any abrasion. The post is fitted with retro-reflective banding bands that improve the visibility of the post during night time and low light use. You should always read the latest guidelines on how and where delineators should and should not be used. These can be found by consulting the MUTCD guidelines that we have linked to. Do You Need Assistance getting the Right System? Please do not hesitate to contact our trained sales team at (800) 671-9662 for free advice and guidance regarding any of our traffic safety systems. We will be happy to help you find the right product for your needs.